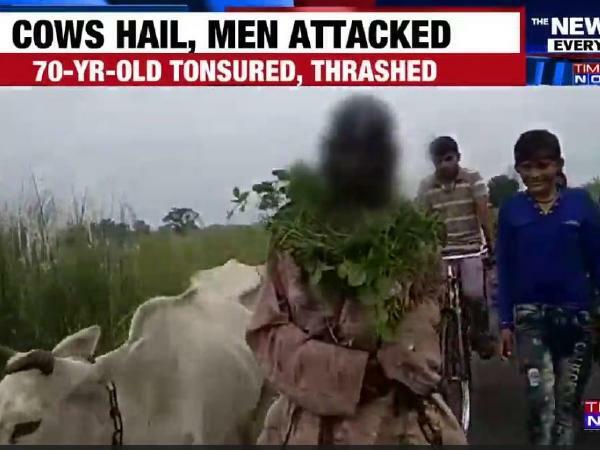 A 70-year-old Kailash Nath Shukla was thrashed, tonsured and paraded through a village by self-appointed ‘cow vigilantes’ who accused him of attempting to abandon his ailing cow. The incident took place when he was reportedly taking his cow to another village for treatment. However, a group of men, claiming to be ‘gau rakshaks’ or cow vigilantes allegedly surrounded him and berated him for trying to dump his ailing cow in the village. The elderly man pleaded with the men to let him go as he was taking his cow for treatment, however, the enraged mob allegedly tonsured his head, thrashed him brutally with sticks and blackened his face. The group then garlanded the man with creepers and then proceeded to parade him across the village.